University of North Carolina at Chapel Hill alumnus Kay Kyser joins us on the blog now with his popular musical quiz program, “The Kollege of Musical Knowledge”. The program originates from Camp Anza in California and was originally broadcast on NBC on April 11, 1945. The first song is “Talk, Talk, Talk” by Dolly Mitchell, which uses a speeded up speech recording as a novelty effect. 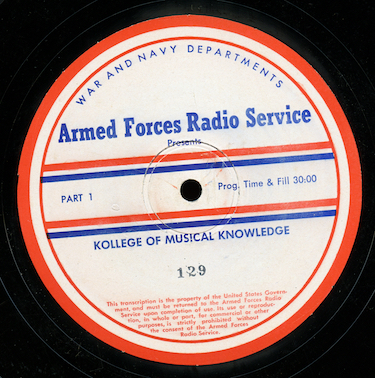 The mp3 was dubbed direct from an original Armed Forces Radio Service 16” vinyl transcription; the date is from the disc matrix. Our thanks to blog listener William Harris for his donation of the disc to the collection! This is an audition for a half-hour game show called “Tune Test”. Similar to “Stop the Music”, the host of the show would call random numbers and ask contestants to identify a song and answer a music-related question. What’s odd about this disc is that I can’t really decide if it’s a real audition for an actual proposed program or some kind of elaborate gag or parody of these game shows. You never hear the contestants on the other end of the line - just the host, Jack Fuller, hawking the fake product "Dimaxio", which does everything and is available everywhere, and creating the most elaborate reactions to the “callers”. Is this Jack Fuller the same guy who was an announcer for “Vic and Sade”? I have no idea if he was working from a script or improvising around some loose notes - regardless, it’s a remarkable acting performance. Our mp3 was transferred from a 16” thin vinyl transcription produced by Radio Ventures, Inc, 75 E Wacker Drive, Chicago, Illinois and labeled “Tone Test Audition with Merchandise Awards”. The master numbers U-1629 and U-1630 and the numbers D-49034 and D-49035 are etched in the run-off. My Google searching couldn’t turn up anything on Jack Fuller except listings at Goldin for his announcing work on “Vic and Sade” and absolutely nothing on “Radio Ventures, Inc”. Based on references to "The Jolson Story" and similarities to "Stop the Music", I'm guessing this dates from the late '40s. What do you think? Is this a real audition or a satire made as some kind of joke? I knew if I put out a call on some OTR related Facebook groups, someone could find info on this. Yes, it was a real show that made it air for a brief period. Martin Grams found a review of the September 12, 1949 premiere of the program. The show ran for 25 minutes, Monday through Friday, at 2:00 pm on WGN in Chicago. It was directed by Carlyle Stevens and a combo called the Tune Testers that worked under other names on WGN’s other programs - Sam Porfirio, Ben Carlton, Fred Kissing, and Al Barathy. Norman Kraeft was the announcer and Jack Fuller was the emcee. Grams also found an article dated September 28, 1949 noting that Radio Features Inc was seeking a delay in Federal Court on it’s suit for a permanent injunction against the FCC’s ban on phone giveaway programs. The president of the company, Walt Schwimmer, had secured a temporary injunction, preventing FCC action against “Tune Test” and another program, “Tele-Test”. The company was pushing the case into what they thought would be a more favorable Federal court in New York, with a hearing scheduled for October. Andrew Sternberg found a few references to the program host, Jack Fuller, in the June 28, 1947 edition of Billboard. He was a personality on Chicago radio and television and the Billboard article reviews the “Sachs Amateur Hour” on WENR and WCFL, Chicago, a program where Fuller acted as an announcer. It would be curious to hear one of the actual programs. I wonder how Fuller could have kept up the pace on a five-day-a-week show like this with the kind of patter he was having to come up with. Even though it's real, it still sounds like a parody of radio games shows to me. "Ladies Be Seated" was an audience participation game show that also had a run on early television. Hosted by Johnny Olson and sponsored by Aunt Jemima pancake mix, with Jemima portrayed by Amanda Randolph, the show has only survived in a handful of examples. Here we have the second half of the show of October 30, 1945 as it was originally heard on ABC radio. In the program, a young newlywed couple from Ohio on their honeymoon in New York are interviewed in the first segment and, of course, given some prizes including a year's supply of Aunt Jemima pancake mix. This previously lost excerpt was transferred from an original line check lacquer recorded by WREN in Lawrence, Kansas, probably to time-shift the show. Return with us now to those thrilling days ... of traffic court. I'm proud to present a previously unheard program from a forgotten local series with a famous voice you're sure to recognize. "Night Court Quiz" was a local show broadcast on WXYZ, Detroit. The producers of the program pulled people from night court and got them to participate in a quiz about traffic laws and safety to win money to pay off their traffic tickets. The program was mentioned briefly in a Billboard magazine article in 1947, noting that the show premiered April 26th and was produced in conjunction with the Detroit Free Press. WXYZ, you may recall, was the home of some classic old time radio series such as "The Lone Ranger" and "The Green Hornet". Our host for "Night Court Quiz" is none other than announcer Fred Foy who provided the well-remembered signature opening lines of "The Lone Ranger" on radio and television. This episode of the series is dated January 21, 1948 and was transferred from an original American Broadcasting Company/WXYZ lacquer dub transcription. The program was previously lost/uncirculated. The disc came from a small group of local programs from various stations from December 1947 and January 1948 that, I believe, were involved in some type of awards competition. We previously heard "The Sandlotters" from WXYZ from this group; I'll be posting more in the coming weeks. By the way - anyone else notice all the radio shows and public service announcements about traffic and highway safety in the late 40s and early 50s, (like the episode of "Suspense" with James Cagney, which is one long traffic safety psa)? Returning GIs must have been hell on wheels when they got back from the War! Broadcast from 1942 to 1951 on Mutual, then CBS, and finally, NBC, "It Pays to Be Ignorant" was a parody of quiz shows that featured panelists of experts - it's a natural followup to our posts in recent weeks of the "Quiz Kids" and "Twenty Questions". In this case, our "experts" are a group of regulars always ready for a quick one-liner or really bad pun. In this post, program 88 in the series as broadcast on AFRS, originally heard on CBS on December 21, 1945. The first question during opening is "Why does the subway have to raise the fare?" and the first question during the main body of the show is "What is the color of the Little Red Schoolhouse?". The show features host Tom Howard, George Shelton, Lulu McConnell, Harry McNaughton, and announcer Ken Roberts. I think this particular episode might not be in common circulation among collectors. Frank, a listener to the blog who has had a long career in radio, remembered seeing "It Pays to Be Ignorant" and other shows live when he worked in the mailroom at Mutual. Now that was an employee perk! The show was transferred from original AFRS vinyl transcription. Date is from the transcription matrix. Here's the last episode in my collection of the popular panel quiz program, "Twenty Questions". Program 51 in the series, as broadcast on the Armed Forces Radio Service, appears to be previously lost or uncirculated. The first quiz subject on the show is Henry Wallace, vice president during Roosevelt's 1940 term. The guest panelist is baseball player and coach, Hank Gowdy. Others in the program include host Bill Slater, Fred Van Deventer, Florence Rinard, Bobby McGuire, Herb Polesie, announcer Bob Martin, and the "Mystery Voice" Don Fredericks. The show was originally broadcast on Mutual and there's no date on the disc matrix. Goldin lists AFRS program 23 in the series dated to November, 1946, so this show was probably broadcast in early or mid 1947. The Newspaper Radio Logs site has a listing from the New York Times for May 10, 1947 listing "Twenty Questions" with Gowdy as the guest, so that could be the original date for the show. Our program was transferred from an original AFRS vinyl transcription. Click reduction software has been used on the master .wav file to improve the sound. Game shows aren't the most common old time radio shows floating around, but they can be fun to visit for some funny ad-libbing by a quick-witted host and guests. Case in point - "Twenty Questions", originally broadcast on Mutual in the 1940s and 50s. In this post, we offer program 1 in the series as broadcast by AFRS. The first quiz subject is the Easter Bunny. We hear host Bill Slater, Fred Van Deventer, Florence Rinard, Bobby McGuire, Herb Polesie, announcer Bob Martin, and the "Mystery Voice" - Don Fredericks. There's no date on the matrix of the disc, so the original broadcast date of the show is unknown. Goldin has a listing for an AFRS program in the series dated to November 1946 that is number 23 in the series, so we might assume this broadcast comes from mid-1946. According to Wikipedia, the show premiered on radio in February, 1946 and ran until 1954. In the 1950s, it was also seen on the ABC and DuMont television networks. A bit of trivia - the juvenile panelist on the show, Bobby McGuire, had to leave the show when he graduated high school and attended Duke University, the institution where I currently work. The show was transferred from an original AFRS vinyl transcription. The "Quiz Kids" was a popular NBC radio series that ran from 1940 to 1953 and featured a panelist of children with high IQs answering questions sent in by listeners . What you might not realize is that there was more than one "Quiz Kids" series on radio. NBC ran promotions where local stations staged their own "Quiz Kids" programs, with winners on the local editions winning a chance to compete on the network series. In this post, the first program in the series "WRAK Quiz Kids", originally broadcast October 12, 1948. The station was located in Williamsport, Pennsylvania and the show is sponsored by the Lundey Paint Store. The program was transferred from an original vinyl transcription, possibly pressed as a demonstration disc for sponsors or for local stations as an example to follow in their own "Quiz Kids" promotions. Matrix numbers are matrix 8980A1 and 8981A1. I've based the date on some internal references in the show. This week, we feature a guest post from fellow otr collector Daniel Sears who shares an episode of a rare panel quiz program. Daniel is the Creative Director for GrumpyFILMS, inc in New York. Here's an episode from a series that I have rarely heard anything about, which is a shame because it's great fun - "The Cliche Club" from June 14, 1950. Your host is Walter Kiernan, ABC News Analyst and future co-host of NBC Monitor. The listening audience sent in funny little stories that represent certain cliches or old hat sayings, and the panel was supposed to guess which saying within two minutes. If a listener's story was used, they got a Rand-McNally Cosmopolitan World Atlas, and if the panel did not guess the cliche, the listener then got a lovely Wittnauer watch. This week's panel is made up of regulars Carol Lynn Gilmer, Associate Editor of Reader's Digest, Agnes Rogers, author and poet who was published in many magazines of the era like Harper's, and Ed Hill, who (from the research I've been able to dig up) was also a news analyst of the period. The special guest on the panel is Bennett Cerf, author, humorist, and co-founder of Random House publishing. The show is a lot of fun, and it sounds like the people involved genuinely had a great time doing it. I've not been able to find the series mentioned on RadioGOLDINdex, and the only other episode I've seen anywhere is posted on the random pages of archive.org. That episode happens to be the one following this, where the special guest is Gypsy Rose Lee. The show was transferred directly from a pair of ABC Network lacquer discs. Once in a while, we have to listen to an old time radio show that's significant for what it says about changes in the radio business, but ranks low as entertainment. "The Stanley Radio Telephone Quiz" is one of those shows. Take a listen to this dreadful show and be appreciative of the many fine drama and comedy programs that survive from the old time radio era. If we weren't so lucky, the legal departments of the network would have had shows like this recorded and preserved to the exclusion of everything else. "The Stanley Radio Telephone Quiz" was sponsored by Stanley, which made shaving supplies. Our example episode was originally broadcast on February 16, 1948. The show includes the Mutual ID at the end, but, based on the contents of the show, it's unclear if it was actually broadcast locally on WOR or on a part of the network. There appears to be only one other recording of the program in the hands of a private collector; it is half of the program of August 9, 1947. The mp3 was directly transferred from a set of WOR reference acetates, number 12-3826.